Are you in the process of designing the kitchen in your new home? 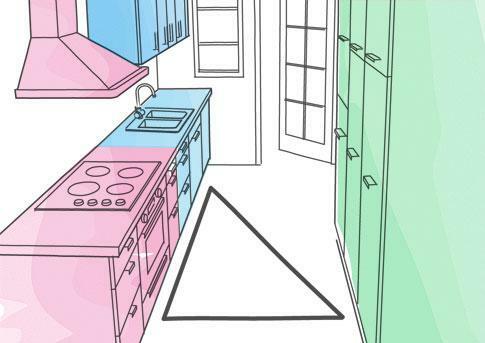 It’s likely you’ve heard about the kitchen work triangle. Although it’s often hailed by designers as the best way to set up a kitchen, the concept of the working triangle alone is not enough. To create a functional, multipurpose kitchen you may need to involve additional elements of design as well. The kitchen work triangle is formed by creating three connecting lines, each two to three metres in length. These lines connect the three main working areas of the kitchen – the sink, oven or stovetop and the fridge. The kitchen trainable concept still serves the purpose of designing a basic and functional kitchen. Keeping a certain amount of space between the main working areas makes cooking much easier and helps keep traffic in the workspace to a minimum. However the ways in which we use our kitchen have changes in recent years shifting the way we should incorporate the working triangle into modern kitchen design. In the past kitchens were much smaller than they are today and were primarily used for meal prepared and clean up. Today, kitchens are much more than a meal preparation room. They are considered the heart of the home. Not only are they designed for cooking and eating; they are also used as an entertaining space, work and study space and more. With this in mind, the triangle concept has evolved to include the zoning theory. Zoning takes into account what tasks you carry out in the kitchen and designs zones of the kitchen accordingly to accommodate for these. Do you have a question regarding kitchen design? Why not call us today on FREE CALL 1800 643 800 or complete the contact form below and we will be in touch with you shorty.